We start on Friday night at Illusions Theater in San Antonio, America where Erislandy Lara, 20-2-2 (12), outpointed Ishe Smith, 26-7 (12), for the WBA light middle title. Southpaw Lara simply was too quick and elusive for Smith, who briefly held the IBF crown in 2013, as the judges awarded the Cuban all three score cards by margins of 119-109, 119-109 and 117-111. After the contest, Lara reportedly expressed his desire for a showdown with Floyd Mayweather Jr, but with "Money" himself making media headlines this week by calling for a clash with Manny Pacquiao, Lara is likely out of luck. On Saturday, there were two big bills in America's Boxing capital of Las Vegas with British welterweight Amir Khan emerging as the big winner. Khan, 30-3 (19), showed great maturity in successfully defending his WBC silver title with a brilliant performance against former two-weight world champion Devon Alexander, 26-3 (14), at MGM Grand casino. Adding an intelligent approach to his already lighting-quick fists, Khan repeatedly baffled the southpaw Alexander, nipping in to reel off sharp combinations before heading back outside. Alexander occasionally scored with single shots but Khan controlled the pace of the contest along with when and where engagements occurred, posting a 120-108, 119-109 and 118-110 shutout on the scorecards. Should Mayweather and Pacquiao actually tangle this coming May, expect the winner to face Khan in a packed English football stadium. 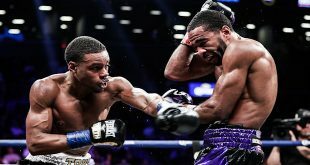 Big punching WBA Interim welter king Keith Thurman, 24-0 (21), had to delve into his seldom employed boxing skills in his win over previously unbeaten European champ Leonard Bundu, 31-1-2 (11). 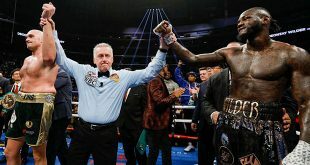 Thurman produced a knockdown in the opening minute of the bout but switch hitter Bundu regrouped and spent the rest of the fight pressuring the Interim titlist, who tired in the later rounds and had a tougher time than the triple scores of 120-107 indicated. Light middleweight Jermell Charlo, 24-0 (11), won an IBF eliminator over Italian veteran Lenny Bottai, 22-3 (9), via a third round KO. The bill also saw victories by former world champions Abner Mares, Victor Ortiz and Beibut Shumenov in experience building contests against lesser opposition. Just down The Strip at The Cosmopolitan, it was an evening of upsets with Irish middleweight Andy Lee emerging as the big success story. Going into his vacant WBO title bout with highly touted Matt Korobov, 24-1 (14), Lee, 34-2 (24), was a definite underdog and for five rounds, found himself getting soundly outboxed in a battle of southpaws. But the lanky lefty struck paydirt in the sixth when a perfect right hook floored Korobov, who could not adequately defend himself from Lee's follow-up assault, which ended the bout at 1:10 of the frame. Lee could be heading for a massive domestic dust-up against Britain's Matthew Macklin, which would do great business in either Manchester or Dublin. 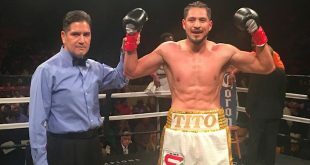 In the headlining event, former two-weight world camp Timothy Bradley, 31-1-1 (12), was unlucky to be held to a controversial draw by former world title challenger Diego Chaves, 23-2-1 (19), at welterweight. Bradley put his speed and skill advantage to good use, ripping Chaves with sharp combinations but after a series of head clashes, the Californian's right eye was nearly closed in the later rounds, allowing Chaves to mount a late rally, producing scores of 114-114, 115-113 for Bradley and 116-112 for Chaves. The result is a big plus for Chaves but not good at all for Bradley, who will have a pull off a convincing victory over a top level opponent if he is to once again obtain a world title fight. Another surprise was on the bill as WBA Interim light welter strapholder Mauricio Herrera, 21-5 (7), was upset by undefeated challenger Jose Benavidez, 22-0 (15), by margins of 117-111, 116-112, 116-112. The unheralded Benavidez, who had never been in a bout scheduled longer than eight rounds, used his big height and youth advantages to land the harder shots but was clearly outworked and outlanded by Herrera, who has been unlucky on the scorecards before.